Steve Moran will teach students as they build their own rods in a three-session evening class starting Nov.8 at White's Outdoor. Cost: $60 plus blank and components. Preregister: 535-1875. Class size limited. Editor’s note: Fourth in a series devoted to local craftsmen of distinguished outdoor gear. Fly fishers in particular are fond of starting with Moran’s technically perfect fishing rods and then letting him personalize the instrument. Choices include exotic wood handles adorned with pen and ink scrimshaw in synthetic ivory or wood inlays. Popular adornments include the angler’s favorite fish or fly. A WSU Cougar fan requested rod-guide wraps in crimson and gray. Anglers and even big-game hunters have commissioned Moran to expand his wood-finishing and inlay talents to create custom tables featuring captivating scenes of anything from North American trout to African elephants. Background: “After building my first rod at 17, I was hooked, and things got stupid,” Moran said. “I started building more and more rods. I was selling them for $15 to friends. 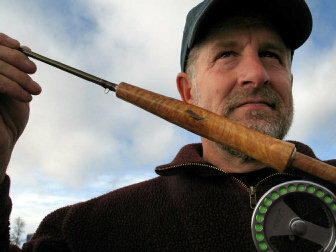 “I was a guiding fly fishermen when graphite rod blanks became available. A man who was with me on a St. Joe River float trip saw one of my first graphite rods and asked what it cost. When I told him $150, he ordered two rods for his anniversary. I thought I was going to die. “He and his wife are still using those rods, I might add. Why a custom rod? “They are made to fit your hand, and you have options to make them fit your taste. No two rods are alike. “You’ll get something you’ll always prize, something of quality that will last generations. About 90 percent of my clients say they like the idea of passing down something of quality, and with so many memories, to their family or friends. Distinctions: High-quality custom rods at a reasonable price. Innovative lightweight hardwood handles, the foundation of every cast. Sinking cork: “Wood handles provide better grip than cork and look better as the rod ages. People who’ve invested a lot of money in G.Loomis and Winston rods have eventually asked me to customize their rod with wood handles. I have a special way of inserting cork rings inside the handle to reduce weight. Photo finish: “I’ve done lots of experimenting with rod finishes and the way they’re applied,” he said, bracing his hand as he applies the finish over guide wraps with a brush. “Don’t drink three cups of coffee before doing this,” he added. “Most people put on a coat and let it dry and then pop the bubbles. I put on a heavy coat while it’s turning, then brush it off. Since there’s no material left, it can’t bubble. I’ll put the rod in the dryer and come back tomorrow. Since they’ve been sealed, no gases can escape from the threads and cause bubbles in the second coat. Claim to fame: Turning 25 handles a day and having them finished in two more days during a stint of making rods for Cabela’s. Recipient of the 2001 Letcher Lambuth craftsmanship award by the by the Washington Fly Fishing Club. Giving back: Moran regularly contributes rods to help fund wildlife conservation efforts. He offers instruction for do-it-yourselfers. Editor’s note: The phone number for Steve Moran’s Custom Rods was updated in February 2010.